“Consider the boy in the above photo. He is what every person on earth hopes their little boy will be: masculine, creative, analytical and moral. He has few toys, but he lives in a nice house in a stable place. Social order is more expensive than people think, and worth more, too. He is an innocent, even at the advanced age of nearly a decade, and he idealizes an innocent future: maybe the military, maybe science, but probably a college education and then a chaste relationship and family just like him. People refuse to understand this, but that right there is the best it gets as a human. All of the drama about looking for an exciting life or something cutting-edge is designed to hide the fact that most people cannot have what this little boy does. Their IQs are too low, their societies too disorganized, their values too individualistic. And so they gnash their teeth and envy this little boy. They will never admit it, but if they could, they would be him. Since they cannot, they will try to destroy him, although since they are socially aware humans they will not do so directly. No: they will teach him neurotic politics, sell him pop culture encouraging self-pity and consequent degeneracy, sabotage the social order around him and turn all the women he might have into self-obsessed whores. That will destroy him, but not get what he has to others, but the worst aspect of the crowd is its notion that if only a few can have what is best, it is better that no one have it. That is the raw unvarnished face of humanity.” — We have met the enemy and he is us. I had the microscope, the Chemistry set, the submarine, the carrier, the globe and the tyrannosaurus. And in the fourth grade I had the music stand. I failed miserably at the bass fiddle. But my microscope was black. I was promised a slightly different future than the one we got. But for all the madness of this age and time, life is still pretty darn good for my wife and me. I am grateful for the good that is. The only thing missing is Tom Swift Jr. on the bookshelf. That was me 77 years ago. That was my six kids 50+ years ago. All of us have matured into stodgy, pretty well fixed, self-sufficient family-types, except the disabled dau. who lives independently, but still needs financial help and never married. Believe me, for a satisfied mind in old age, it’s the way to go. I feel pity for those who chose or were issued some other route, always searching for that certain something. Yes, this could have been me. I once made our entire house smell like rotten eggs. Chemistry is fun, yes it is. Yep. This could be me in 5th grade (1965-66). I had a microscope, a chemistry set, and at least a few of the identical models on the shelf (that King Kong model, that Godzilla model, that Dracula model, at least one Rat Fink model, etc.). I was skinny with short hair, too (Navy brat). I chunked up in 6th and 7th grade, but was skinny again by the time I entered 9th grade. The curtains are a lovely shade of toxic masculinity. Similar, but I was more likely to be playing with an Erector Set or Lincoln Logs. Lots of books – I went through a bunch of Revolution Era biographies (e.g. ; George Washington, Paul Revere, Patrick Henry, Eli Whitney), and read all The Hardy Boys. Most of the rest of the time I was outside with neighborhood friends playing games like baseball, dodge ball, tag, hide and seek, or just general exploring. Had the haircut. And I hope the kid’s got a box of comic books under the bed. Real comic books with real heroes and without a whiny angst ridden introvert among them. That dang Creature From the Black Lagoon has these little, tiny fins all over it. You had to carefully glue every one on there. I’m certain that I missed a couple. I think that see-through dog is around our house somewhere. I also had 1:72 scale fighter planes hanging from the ceiling – maybe a dozen of them. Me-110, F4F, P-51, Zero, etc. BTW, it is Jewel for the win with her toxic masculinity quip. My 2 cents. I join with the Klahn in proclaiming Jewel for the win. It’s not just nostalgia; the United States was still a great country. That was my brothers. And I always thought boys’ toys were cooler than girls’ toys. You eloquently described what the democratic party has become through the ever so sly manipulations of their handlers. They are so brainwashed that yes, they “refuse to understand”. Do you think Christianity will ever wake up to what has happened? Could be me 63 years ago. Chemistry set, single shot .22 on the wall, drawings of WWII fighters in dog fights done by me (sometimes drawn in class at school discretely). Also a large Erector set that kept me and my brothers busy indoors on winter days of rain or snow. The rest of the time we were outside. No TV reception in the rural mountain area we lived in. I built a running steam engine at ten years of age from a kit I received for Christmas. I also built many, many model airplanes, model cars, model ships and etc. Built a huge box kite for one our cats to fly in. Yes, it came back safely. Never had enough time to do all I wanted to as a kid. Boredom? What’s that? I could go on and on. My son and grandson left yesterday after a brief visit. Very, very different times indeed. The value system is near total destruction. And, I took the Winchester .22 to school on Thursday for the marksmanship training class. Can you guess which US State this was? You had to mention The Creature From the Black Lagoon model. It was my favorite one. I repainted that thing in different shades of green until you could hardly see the scales. I got together with the girl who lived next door, and we dug up her sandbox to make a beach scene with a wash tub of water. We posed her Barbie Doll being menaced by the Creature, and took black and white pictures with her Brownie camera. All lost in time. I’m grinning just thinking about it. Growing up in east Tennessee, in a rural agricultural mountain town, I had these things and even a Sears & Roebuck .22 rifle! Unheard of today. I have shared this article with my 300+ roster of fellow travelers I call the Vast Right Wing Conspiracy (thanks, Hillary, nice name…. I stole if from you fair and square). As someone may have said, “All is answered to our satisfaction on the Other Side, despite all the tears we cried. Death is a creepy, squeaky two-way door; opening outward to light and love and more, forevermore, and inward to welcome giggling newborns — gifts from that Other, Mother Side. If you don’t believe me, ask the hugging, hugged nursing mother. The Patriarchy is OK and the Matriarchy scores the KO wouldn’t you say? That was certainly me circa 1975. I LOVED Godzilla movies! I used to build model tanks, hot rods and airplanes in my room. I spent hours in solitude, busy with my own interests, while listening to the local rock radio station. To this day Godzilla by Blue Oyster Cult is a favorite song of mine. So as to the what’s on the shelving, I built more than a dozen Revell ships of WWII vintage. Loved the war in the Pacific as it was one of my voluntary academic studies. I used to position the fleets and imagine the battles, with my own imagination, the horror I know. Ended up placing firecrackers on and in the ships and using the glue to light them on fire. Most fun. Guess who cared that I was 10 burning stuff in the yard and blowing it up? 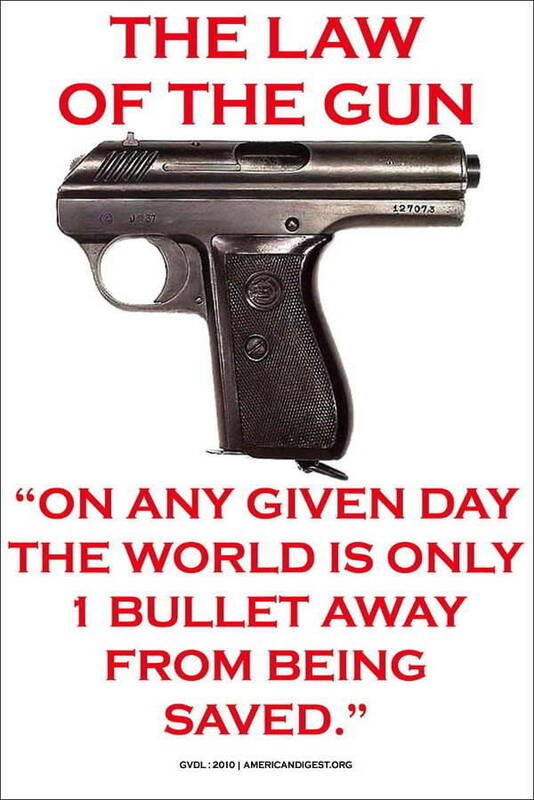 Nobody. Too poor for the chemistry set. So, we experimented with household products, such as ammonia and bleach. Still coughing after all these years. Kids nowadays don’t know how to have fun. Nothing toxic about those curtains, Miz. Jewel! What curtains did YOU have. Prolly pink bunnies or something equally sappy. Nauseating! Haha, go to just about any homeschool in America and you’ll see boys who look like that. I laugh because that looks a heckuva lot like one of my boys sitting there doing his home schooling. I have eight children. The oldest boy graduated at 16 and worked two hard years as a mason. He just turned 18 and is starting a civil engineering program with paid off pickup and $20k in the bank. Holy cow. What will they ever do when they discover Wagner’s “Tristran und Isolde”? The Mind reels, because the Mind knows. In reading down the list above, look at the things boys used to do before the advent of mainstream computers. Ride bikes, skateboards, anything with wheels, even homemade. Build models left and right. Play every sport known to civilized man. Play in the dirt with cars and soldiers. Do science and art projects. Create, learn, experiment, wonder why, question everything, try stuff just because. In the pursuit of those things, get burned, cut, bruised, pinched, bleed, cry, try not to cry, be successful, fail, learn from mistakes, teach others, learn from others, a little bragging, and be humble. 20 years post 2nd great war everything was in place just like it should be and some how it’s not any more. Small pockets remain here and there but mostly it’s different. When I started writing this I felt like I was at my 10th birthday party, and as it went along flowing out of my fingers like memory ink, it turned into a funeral. This thread is fantastic. I wish my 17 year old grandson was here so I could discuss this with him. He loves nostalgia and fifties anything. I had maybe 80% of that stuff- plus a 1935 Briggs & Stratton engine my dad had squirreled away in the basement. At 13 I got the thing ticking over. All my interests funneled into all things internal combustion after that. Back to motorcycles due to a thin wallet. Mechanics were never a vocation for me. I just wallowed in the enjoyment of spinning the wrenches, getting lost bringing old, neglected machines back to life-which continues to this day. My 50 year bridge to the past. Great comment from Jewel! It’s a girl thing; I noticed the curtains first off, too. Bet his Mom picked those curtains. Early Americana,very SturbridgeYankee Workshop. My brother and I pooled our allowances & chores money for every WW2 plane,ship & tank the hobby store had. (Real airplane glue was used,not the stinky snowflake stuff of today). We re-enacted tank battles with lighter fluid & matches to simulate explosions. You’ll be the death of me, Gerard. I had so much of this stuff I can’t begin to tell all of you. From the U-505 U-boat model on the top, through Godzilla and the Universal monsters, to the chemistry set, this was my childhood and every boy I knew in SoCal in the mid 60’s. Don’t get me going on the comics under the bed. Thank you, Gerard, and all of you for your wonderful comments. There are still a lot of us out there, toxicically masculine curtains notwithstanding. Good piece, but not sure why it was assumed that the boy is not going to have an exciting life. Maybe he will be founder of a startup (even a ‘cutting-edge’ startup, lol). Maybe he will be a test pilot. Maybe he’ll be an astronaut, or ‘just’ a scientist doing really exciting (yep) research. You don’t have to be dysfunctional to have an exciting life, indeed, that makes it *less* likely. What do you mean “could have been me”? That was me! How did you get access to my mother’s photo albums? Lance, the “toxic” curtains are a good thing…Jewel knows that. Yep that was me in the 50s, in Dade county Florida. When my daughter was born in NYC we moved up here to the top of the world, North Pole, Alaska and..
the could be my son here in the 70’s. 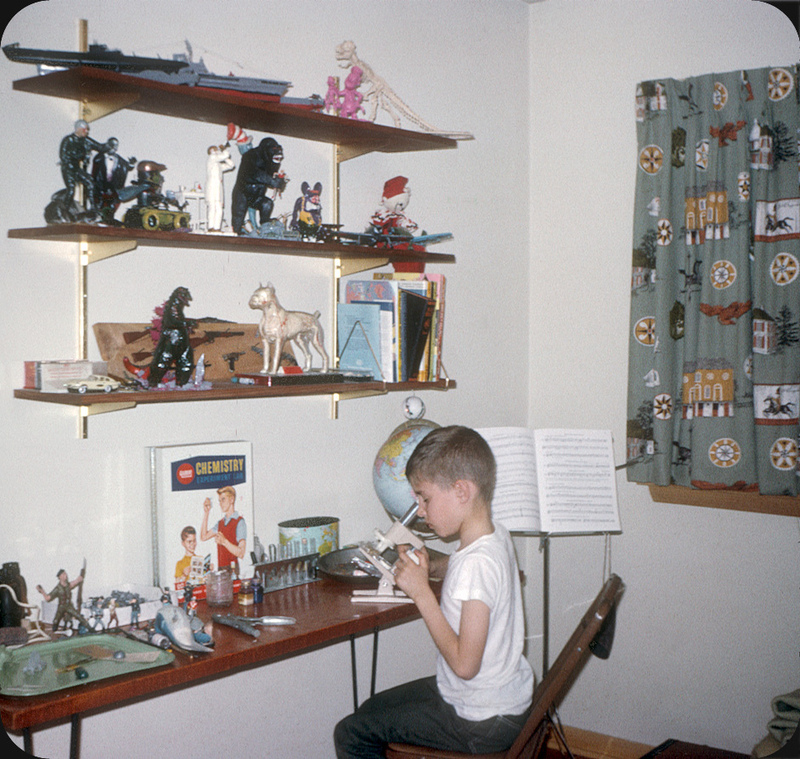 Never had the “action figures”, but if you added in a few more ship (and tank, airplane, and car) models, traded the music stand for a baseball bat and hockey stick, and put more books on the shelf, then you had my room, circa 1965. The details matter less than the overall theme. This was what a boy’s room looked like, and we were good with that. That could be me with the chemistry set, except I had models of science projects on the human body on a shelf..and I’m a girl. Bike riding, building tree houses. Was I lucky or what, to have been young at such a time.? I love those toxic curtains, lol. Definitely me 40 years ago. Microscope and slides, Revell model kits, globe, sheet music, Matchbox cars. And a full shelf of books. I grew up in a Hispanic household in Albuquerque New Mexico. Born in the 50’s grew up in the 60’s and 70’s. Believe it or not, not much different than most of you. We were lower middle class. Dad worked for the local electric utility, mom worked at the catholic school we all (4 of us) attended. I swear to you that kid ^ looks like a slightly lighter shade of me. I had the combo microscope/Chemistry set. I’ll confess I still have a microscope. My curiosity hasn’t waned. I’ve always loved optics. My brother had a telescope. We had a good portion of the stuff this “boy” had. Some of it I wouldn’t have…..(we all thought Godzilla was too fake, but loved laughing at it). But we had this and other boy stuff of the same vintage. Probably more sports stuff like baseball and football gear. I also figured out a way to get an aquarium in our crowded little room. Our parents taught us the value of WORK. We caught and sold lizards to the Univ. of NM, sold news papers and doughnuts, Then got paper routes, worked at the local fast food places and bowling alleys and we all went on to be successful. Just like that ^ BOY. When I look at all the things in this boy’s realm, I ponder my own ersatz boyhood. I had Tonkas, gyroscopes, all manner of Whammage, a living dog, my bedroom window that allowed me to escape into the giant tree and the great beyond the back yard. I had a harmonica, a Jew harp, an ocarina, a brass fife, drumsticks, a dog whistle, all kinds of model cars and creepy crawlers. I had the best boyhood ever. The transition into womanhood was painless and didn’t involve surgery or hormones. Speaking of the “Creature from the Black Lagoon”… my youngest son is a Park Ranger at Silver Springs, FL where the movie was filmed. One day he received a call from a gentleman wanting to donate the costume of the creature to the park. So, he made a run up to the panhandle to this man’s house only to discover he would have to crawl through his attic and find the various boxes that “may” contain the creature. Keep in mind this is FL, July, attic=HOT! He loves preserving the park’s history so he did what needed to be done and retrieved the creature. It stayed at his house for a few days while he cleaned him up, (much to his beagles’s dismay), and is now displayed in the museum. Had lots of similar stuff. Aurora made a huge B-26 that was part of my extensive collection. Had all of the century fighters. Didn’t have the chemistry set…had the biology set. Dissected a small bass. It had a tube of diotomaceous earth, best I remember. Grew up with a bunch of guys who were around the same age. We’re still friends after 60 plus years, and live nowhere near each other. One time, when we were in our early teens, we decided to ride our bikes to Kennedy airport. That we did. Even went across a taxiway, and avoided a taxiing DC-7 by a couple of hundred yards. It was a great life. Memories such as those help sustain you. God be with and bless y’all. …And we played soccer in the snow! Could be me, could be any one of my friends at a time when even southern California was normal. And yes, if one is fortunate enough to know folks who home-school you can still see children like that. Gives an old guy hope for the future and inspiration for my grandchildren. That looks like a room for a northern boy. There is probably a stamp collection and a coin collection in there. Growing up in Jacksonville, FL we didn’t build so many models and indoor stuff. We kept our Tonka trucks and little soldiers in “The Hole”. In a bid to try and grow some real grass my dad moved a dump truck load of manure into the far left back corner of the yard. He probably managed to spread about 1/4 or 1/3 of it out front. Still, the grass didn’t grow. But things sure grew in “The Hole”. One year we even planted some corn seeds in there. They grew at least 7ft high. Eventually, as the smell dissipated we began digging. We had roads, highways, houses, forts, factories, etc. We attacked each other with the little soldiers and dug trenches for them. then we took to digging deeper and deeper and eventually found water. Wow! Way cool. I wonder how many little men were lost down there in the little swamp. Unless there was lightning we were outside all the time. I rode my bicycle all over town. Miles and miles to go before the sun set. But always home for dinner. My room was for sleeping and my closet was for storing little men. No 22 but I did have several very capable slingshots. We climbed trees, made rope swings, swam in the creek, climbed on the roof and developed lots of skin cancers which I am now dealing with. At night when it cooled off we would set off after dark and traverse the neighborhood through the back yards. Sneaking over fences, up on roofs and behind sheds. Great fun. We learned how to move quick when the dogs started barking. We knew no boundaries and didn’t really understand property lines. A straight line was always the best way to go. We swam in tidy-whiteys in the ponds in the sand mines. Wandered around on the roof of our elementary school during the summer. Boy, it sure was a good thing Mrs. Minchew didn’t catch us. Whew. Basically, life was constantly on the go. Always going somewhere, usually on the bicycle. Winter time sometimes brought icicles. If a freeze was predicted, everyone turned on their sprinklers in the front yard. The next morning everything was white and gleaming. Often back up to 60 or 65 by 2pm. No worries. Put on a sweatshirt and cruise the neighborhood and look at the icy sights. When I was 12 we moved down to Merritt Island. Got a house on a canal. Everyone I knew had a boat. Fishing boat. Speed boat. Water skiing boat. More sun. Lots of water. Always on the move. The Indian River runs from Daytona all the way down almost to Palm Beach. Plenty of water, islands and inlets to explore. Camping on the islands. Building Australian Pine log fires. Messing around with Horseshoe Crabs (yuck). Chasing dolphins in the river. Water skiing in the Grand Canal.